Are Monsanto and Biotech Using Hawaiian Island as Petri Dish? If you hear Monsanto tell the story of genetically modified crops, you’ll be told that they are the answer to world hunger, pest problems, and are completely safe. But ask the people who live where Monsanto has grown and tested their crops and you’ll hear another story. It happened in India and Argentina, and some say it’s now happening on the Hawaiian island of Molokai. Only around 5,500 people live on Molokai, but biotech giant Monsanto leases some 1850 acres of land there to grow their Bt corn. Bt corn is a genetically modified corn made to ward off insects with pesticides inside the seeds. Evidence suggests, however, insects aren’t the only ones in danger. Not only are Bt toxins showing up in our blood and urine, but a new study indicates they are capable of killing human embryo cells. Tell that to Monsanto or the government regulatory agencies that allow the GMO seeds to grow. On Molokai, Monsanto employs around 165 people, many of them who have worked at the research facility before Monsanto came to the island, back when it was operated by the University of Hawaii. Smith points to several locations where villagers and locals suffered ill health when Monsanto came to town. From allergic reactions to increased suicide rates, GMO crops from Monsanto are not new to geographic controversy. “Not only are biotech crops safe, but data collected since commercialization of biotech crops in the mid-1990s show that biotech foods have contributed significant benefits to large and small farms worldwide, as well as to the environment in farming communities,” says Paul Koehler of Monsanto Hawaii, who unsurprisingly supports the GMO efforts not only on the island, but globally. The islanders aren’t so sure. Though some of them depend on the seed giant for their livelihood, others aren’t convinced the industry has done enough to prove their seeds and crops are safe to eat, grow, or even live near. Hawaii as a whole is not generally receptive to biotech’s bullying. 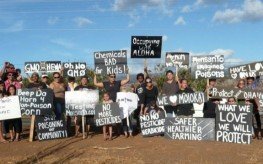 Citizen activism in Maui is has led to petitions to halt GMO giants from invading, while the mayor of the Big Island Hawaii, Billy Kenoi, has banned biotech GMO. That’s right! Hawai’i Island took a stand against the biotech industry. Now it is in the courts as the industry fights a legal battle. Nearly everywhere biotech does business eventually becomes home to people who resist biotech because they see the reality on the ground. Sadly, the big agribusiness farmers have bought into biotech since they were led into it. They even put the noose around their necks in this era of go big or go home. The reality is “go big and lose your home” since the capital intensive method way of farming is failing. Very simple. You can only mine the soil for so long. “Nature demands a gift for everything we take”, not returning organic matter has ensured that pests, disease and weeds are thriving. Unfortunately, it is when it is too late that many farmers realize their fate.